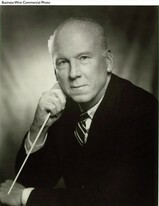 Leroy Anderson composed short, light concert pieces, many of which were introduced by the Boston Pops Orchestra. He was described as a great master of light orchestral music. Anderson's musical style uses creative effects and sometimes includes sound-generating items such as typewriters and sandpaper. Many of his pieces were commercially successful. Sleigh Ride, Blue Tango, and the Typewriter are among his most popular.